Could Fagerström (SWE) surprise against Krenn? Could Struthers (ENG) surprise against Källberg? Could Adolphe (BELG) (another home favourite) surprise against Dickert? Could Chan (CHIN) - a former commonwealth games gold medalist in mixed badminton and a division 2 squash player - surprise against badminton specialist Druve? Could Dorenbos (NTL) - No.5 on the Dutch squash ranking and the runner-up in the recent Dutch Championships - surprise against Lautala-Näycki? Could Woerdt (NTL) - the recent Dutch Champion and a national top 20 badminton player - surprise against Horvath (who might be injured). Could anyone really stop Carleke (SWE) - the 2003 and 2004 World Champion, who never lost to another veteran - from beating Norton and then win it all after beating the other Swede in the final? Could Hellgren (SWE) - the rapidly improving handball legend (once considered the best handball goalkeeper in the world) - surprise against Greatorex? Contagiously inspired Keith Lesser, the Racketlon.com journalist and the creator of the British & Irish Racketlon Tour develops these thoughts and many more in his World Championship pre-view below. For the 6th time a Racketlon World Championship is held and for the first time in Belgium! For some, Belgium has represented some of the best tournament experiences and it is a privilege to write about the first World Championship to grace the land of the Ardennes, where bar snacks aren't bad either (cheese and sliced sausage among other things). China have the potential for a racketlon revolution! 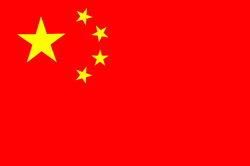 A team from China has entered the Worlds! Film Director Ron Howard describes "sang real" in the blockbuster hit "The Davinci Code". Royal blood and Sophie Nevau may have the potential to rock the foundations of our existence in this "fictional?" based movie. However, Racketlon Director Gert Peersman with China and "sang raquet" is an even bigger story. With Asia such a formidable force in table tennis and badminton, when will they mass invade racketlon? Only for Europe to reminisce about the times we could once win medals. Racket blood is coming! We may look back at 2006 and say that was when they came. For a nation with approximately a billion people, China may in the future dominate racketlon, much like it has dominated table tennis for many years. A sport with such passion and excitement is likely to stir interest across the whole of Asia and it is only a matter of time before stars emerge. There is no doubt in anyone's mind that the 6th World Championship is set to be the most spectacular racketlon show on Earth. 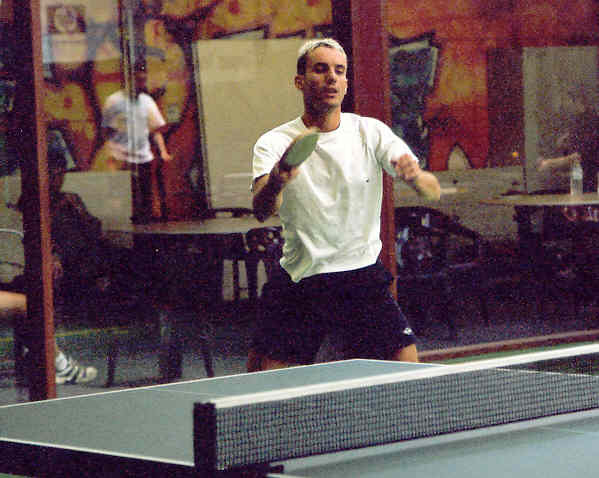 With a record number of participants (around 444) from around 23 countries, people are travelling from all around the world to play not one, not two, not three, but four sports (all in one) - its called racketlon! Can Mikko Defend his title? Only what seems like minutes since the Finnish Open, where Magnus Eliasson defeated the World Champion for the first time in Lahti. The momentum now seems roughly even. Vienna was not so long ago and another Eliasson - Kärkkäinen final would be electric. Can anyone else stop the inevitable? Eliasson vs Kärkkäinen in Lahti. With pimples(!) on his tt backhand Eliasson got his revenge by a difference of +10 points (tt:13-21, ba:21-14, sq:21-16, te:18-12). Compare that to the results from the last Worlds in Vienna -11 (tt:3-21, ba:22-20, sq:22-20, te:11-8). 2005 Bronze medallist Richard Thomson is the biggest absentee, however the Mens Class A has much more depth and strength than ever before. With this, of course, brings a supreme fight for the rankings and the medals. Who can upset the odds? If I had a flutter I may gamble that Fagerström has too much for Schaub and then Krenn and bows out to Magnus who strides on to the semis. The news that Iain Dowie is pronounced the new manager of Charlton Athletic reaches Matthias and causes much anguish, unable to recover mentally, losing all focus during squash. Calum Reid is coming! Doug Struthers - A World Champion? Calum Reid may edge out Christian Wall as in Edinburgh last year and win through after an almighty tussle with the ever-improving Jon Foulds. However, mighty Doug Struthers looks to make the Chris Noakes prophesy come true. Is he a future world champion? Struthers v Reid is a repeat of the quarter final of 2005 and either way Magnus will have his work cut out in the semis. However, don't count out Källberg, neither Struthers nor Reid can get many points in table tennis and the pressure will be insurmountable from all angles. 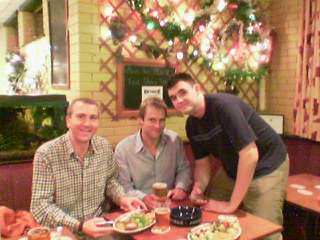 Doug Struthers, Chris Noakes and Ray Jordan enjoy Christmas dinner back in 2004. Groups 8,9,10 & 11 are hard to call. Home advantage may be useful for Peter Duyk as he faces Weigl and Mullamaa, a presidential group. We could have a three-way tie, with all coming down to points. 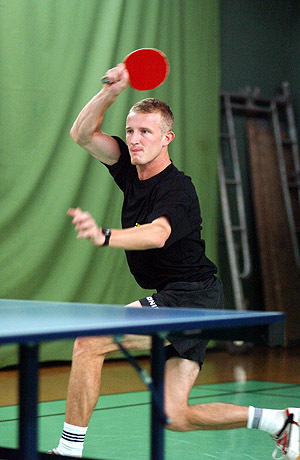 Rickard Persson may have too much for any of them, although Duyk's table tennis/tennis combination is not ideal for Rickard who may struggle in what is also his two strongest sports. John O'Donnell might have something to say. Group 11 is the hardest to call of all the groups. Ray Jordan quotes "the group of death". Kudicke, Nordstrand & home talent Adolphe Fernandez-Diez will certainly get a good workout! Macey gets his wish and avoids the top seeds. Can he show the world what he can do? Macey would certainly be a dark horse to go through and face Mikko in the quarters. Ladies Event - "More Open Than Ever"
While the women seeds are straighter forward, a few dark horses could upset the trend. Could Dorenbos (NTL) - No.5 on the Dutch squash ranking and the runner-up in the recent Dutch Championships surprise against Lautala-Näykki? Could Woerdt (NTL) the recent Dutch Champion and a national top 20 badminton player surprise against Horvath (who might be injured)? Natalie Lawrence who has come from a racketlon training camp in London certainly also poses a great threat and her tennis may give Lautala-Näykki some trouble in what looks to be the hardest group. 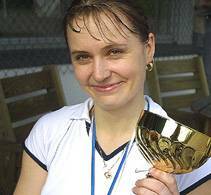 Lilian Druve was dominating racketlon for quite a while, but no such luck has been gained recently. Kraaving (Estonia), Jansson (Sweden) and Horvath (Hungary) won the Finnish, Czech and Hungarian Opens respectively. Such accolades cannot be overlooked. The return of Katy Buchanan (Scotland) may raise an eyelid or two and Hanna Miestamo comes fresh from Finland ready to conquer. Silke Altmann (Germany) has a few tour titles under her belt and how she would love to add the World Championships. Victories include Gothenburg, English Open and, of course, last year in Oudenaarde was Silke's first tour victory. Pär Carleke returns to action! Never lost. Never even close. Mighty Veteran Pär Carleke, Sweden. 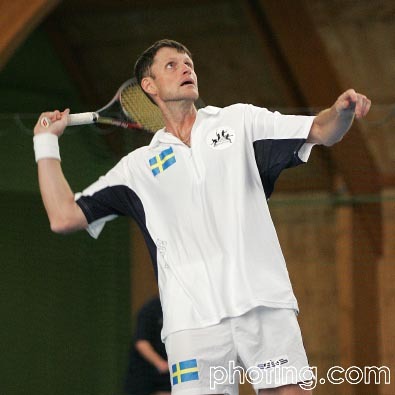 Pär (Sweden) will have a tough match with Kevin Lawlor (Scotland), Graham Norton (England) and Dave Greatorex (England). Fellow Swede Ulf Bredberg and Richard Whitehouse (England, again) will have a mighty battle and although Bredberg won in Vienna, do not count out the vicious squash genius! Whitehouse needs points at TT and in winning badminton and battering squash, he just might make it through. Could Hellgren (SWE) - the rapidly improving handball legend (once considered the best handball goalkeeper in the world) surprise against Greatorex? Bredberg v Carleke is the match racket lovers want to see, and is the match that may just materialise as the best Veterans match of all time. Can anyone upset Carleke?? (who has never lost to another Veteran). The Team Event is Hot! Sweden is, of course, the favourite, but this year might bring a slight twist. The Germans are strong as ever and with Finland, Belgium, England and Austria mount the strongest challenge. Austria's silver medal in Vienna last year is going to be difficult to repeat and England or Finland may make it through to the final. Krenn/Dickert (Austria) will have trouble from Wall/Håkansson (Sweden) and O'Donnell/Foulds (England). Zwiers/Koepf (Germany) v Munro/Kerins (Scotland/England) should be interesting, but short lasted. The reward is dinner with Rickard Persson & Matthias Fagerström. It might be best here to skip the starter and go straight to coffee. Weigl & Kudicke (Austria/Germany) may face charismatic pairing Hasmats/Rickan (Sweden). Fagerström and Persson could win. Much deserved glory for a QPR and a Charlton fan and two of the nicest guys on the tour. The big favourites in the mixed look like Druve/Nilsson (Sweden), Reid/Buchanan (Scotland) and Stamm/Altmann (Germany). Anything can happen, a gold medal for Scotland is not out of the question! Calum Reid looks set to become a triple junior world champion. The Over 55's event (first introduced in Vienna last year; see results (.pdf)) is nice to see and Ken Bound looks like he might be the one to beat. Libal and Eklundh will also fight to the end. Most other events look there for the taking! A 9AM-5PM marathon takes place on the Monday after the event. The IRF Council will take the opportunity to talk through many of the important decisions for our sport today. Let us wish all the participants the best of luck and thank them for giving up and putting in so much time to this great sport as unpaid volunteers. With such great things like a 2006 British & Irish Racketlon Tour - see www.activeeurope.com , the first Hungarian Open Championships and Racketlon in Malaysia - see www.malaysiaracketlon.com racketlon is on the up. Dignity & respect is due to all these people and with a good balance of calmness, diplomacy and drive we can look forward to some great times for racketlon! Jan Vercamme, Gert, Serge (weather expert), Christophe (shuttles), Hilda (accommodation) - Thanks so much for all your work, see you soon guys!